Gary Ralph Lowell Nelson passed away at his home on October 8, 2018 with his daughters holding him in their arms, fulfilling his wishes on how he wanted his final days to be spent. He was diagnosed with Mesothelioma in 2015, and his family is ever- grateful for the extra time they had with him beyond what was originally expected. He was born on December 14, 1936 to Ralph Hjalmer Nelson and Ruby Lenore (Helmerson) Nelson. He was a 3rd generation Norwegian immigrant homesteader of Cook County, and was most-proud of being 100% Norwegian, as well as “a local” of Grand Marais. Gary lived his entire life in Cook County, except for the year his family spent in Excelsior, MN when Gary was a young teenager. Preceded in death by his parents; wife, Lois Paulette “Polly” (Lehto) Nelson, and great-grandson, Mercer Gustav Everson. He is survived by his daughters, Doretta Nelson Busbey (Doug), Kathryn Nelson-Pedersen (Mark), and Stephanee Nelson Everson (Ronald); his grandchildren that adoringly called him, “Papa”, Tyler (Carrie) LeGarde, Brienne (Anton) Moody, Dustin (Gina) Nelson, Andrew (Simone) Strand, Alex (Breanna) Everson, Natalie Everson (Furqan Balouch), Lily Nelson-Pedersen, Dengalo, Sigame and Sitota Busbey; great grandchildren, Eero and Hiver Moody, and Aiden and Sophia Everson; sister Charlene Anderson, and beloved feline companion, Toby. Gary’s young life was spent enjoying idyllic days with his grandparents, John & Tillie Nelson, and Herman & Lena Helmerson. Family gatherings were most often enjoyed at the Nelson homestead on Maple Hill, or the Helmerson homestead on Good Harbor Hill or their Pike Lake Resort. Gary’s grandfathers taught him to love fishing and hunting, being out in the woods, and how to be a dependable and persistent worker; being strong and fearless was important. In 1955 Gary married Patricia Stephens. They built a home next door to his parents who were always a guiding presence in the lives of Gary & Pat, and their daughters. When his daughters were young, time was spent ice fishing, marathon snowmobile rides, picnics with his uncle and aunt, Hjalmer & Rachel Helmerson, partridge hunting, long Sunday afternoon rides on gravel roads, bear watching at the dump, hauling firewood, making sure no hands were ever idle, and visiting with family & friends. In 1984 Gary married Lois Paulette (Polly) (Lehto) Mathisen. Gary & Polly shared 32 years of marriage before Polly passed away in 2015. Their home on Coyote Ridge was a sanctuary for them where they enjoyed watching and feeding the many deer, foxes, birds, coyotes, chipmunks, and all the creatures of the forest. The day before he passed, he told Kathryn, with a big, broad smile, “there is no place on Earth I would rather be.” Gary loved doing everything well, and for being known for that. 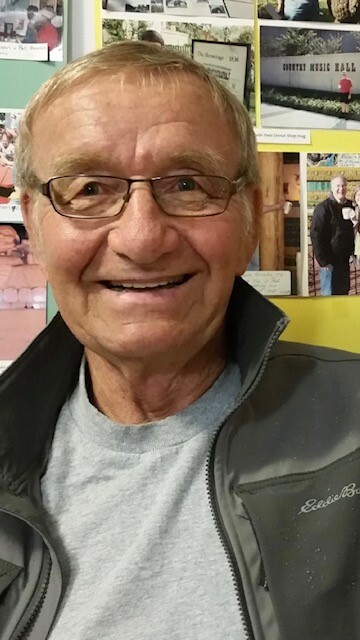 He was extremely proud of his tireless work ethic and the friends he made along the journey of his working career which began as a youth selling fish for his uncle, Russell Zerbach, and included working for C.O. Backlund & Sons, Cook County Highway Department where he worked alongside his father, owning his own trucking company, and after retiring from Hedstrom’s Lumber Company, Gary continued to work for Edwin E. Thoreson where he was appreciated for his finesse, ability, and engineering genius for operating an old-time road grader and building roads. He showed the younger generation how it was done, becoming a mentor to some. He only quit working at the age of 78, when his health began to decline in 2015. After his retirement, Gary was a self-identified “gad-about” and enjoyed nothing more than his daily “appointments” with his friends for breakfast at South of the Border and coffee breaks at Subway or The Donut Shop. He had special memories with each of his friends, as well as an often-humorous anecdote for each that was told often. The space to name all of his friends is not adequate, but you know who you are and what you meant to Gary. He will be particularly missed by his good, long-time friend, Clifford Berglund, with whom he shared a special bond. Gary’s family is grateful to his many friends that kept a close eye on him over the past three years and before. It has been a comfort to know that their dad was loved and cared for by so many. The deck of the Java Moose was where he could be found in recent months, enjoying the afternoon sunshine and people-watching, drinking coffee or eating ice cream, surrounded by his family and friends. These are cherished moments and will be held dear forever. Gary enjoyed home-cooked meals and sweet desserts crafted by Kathryn; being the apple of everyone’s eye; vintage automobiles; telling a good “Ole & Lena” joke; music of the Bee Gees; being outside doing anything; road grading; spending time with his family; wood working; fashioning diamond willow walking sticks; fixing anything that needed to be fixed; and sharing a laugh with anyone around. Gary was a diehard Minnesota Vikings fan for 50-plus years, who never gave up the hope of a Super Bowl win. His love of the “Purple People Eaters” was everlasting, and he was delighted by that Sunday’s win. He will be lovingly remembered for his loyalty, tenacious spirit, twinkling blue eyes, devilish smirk, flirtatious manner, youthful handsomeness, subtle wit, looking dapper, and according to his mother and those that were blessed enough to see them, his beautiful feet, of which he was very proud. The family requests in lieu of flowers, a donation be made in Gary’s name to the Lake County Humane Society, PO Box 27, Two Harbors, MN 55616. Memorial service to be held at Bethlehem Lutheran Church at 11:00 on Tuesday, October 16, 2018. Interment following service at Poplar Grove Cemetery with a luncheon to follow at Bethlehem Lutheran Church.